Our playroom is one of my favorite places in the house… it’s colorful and cheerful and has lots of fun patterns. But, it’s also fairly small and gets A LOT of use so I have to be cautious when decorating it for any season. 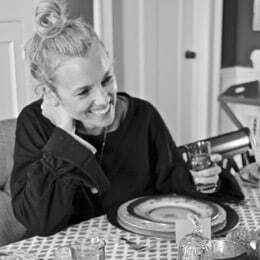 I was THRILLED to be asked to share some of the amazing fall decor options from TJMaxx and their selection couldn’t have integrated with my decor more seamlessly. Last Saturday we had friends over for dinner so I had to officially clean the house and get some holiday decor set up! In the past, I’ve pulled down every last box from the attic and crammed everything into a spot and draped everything over a surface. This year… not so much. I always seem to gravitate towards greenery and… something a little fun.